The apple crisp is in the oven, filling the house with its fragrance. And suddenly, for the brief span of an hour, there’s nothing to do but just be. So I put the kettle on, and I make sage tea. If the finest pleasures are the simple ones, then sage tea is elegant in its effortlessness and ease: just a branch of green velvet leaves, a golden dollop of local honey, and a cup of hot water. That’s all. 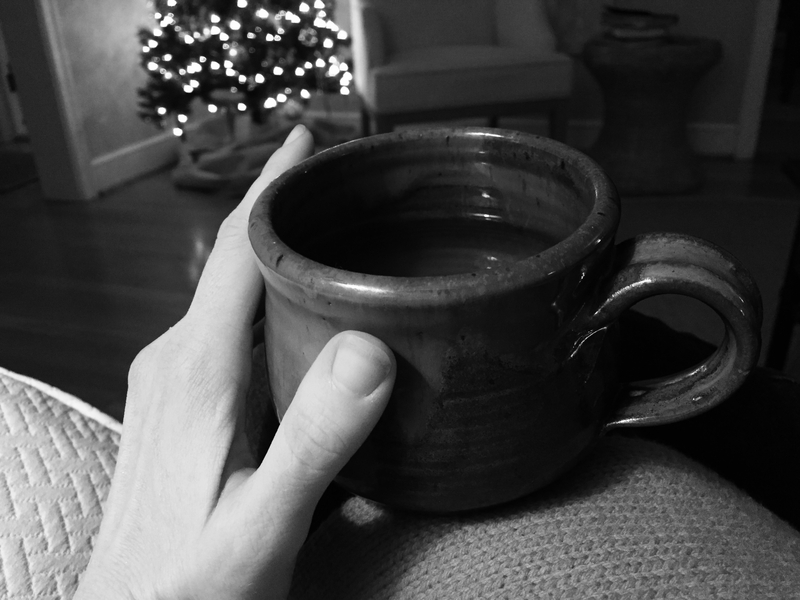 I take it with me into the front room and sit quietly with the heat of the cup on my knees. 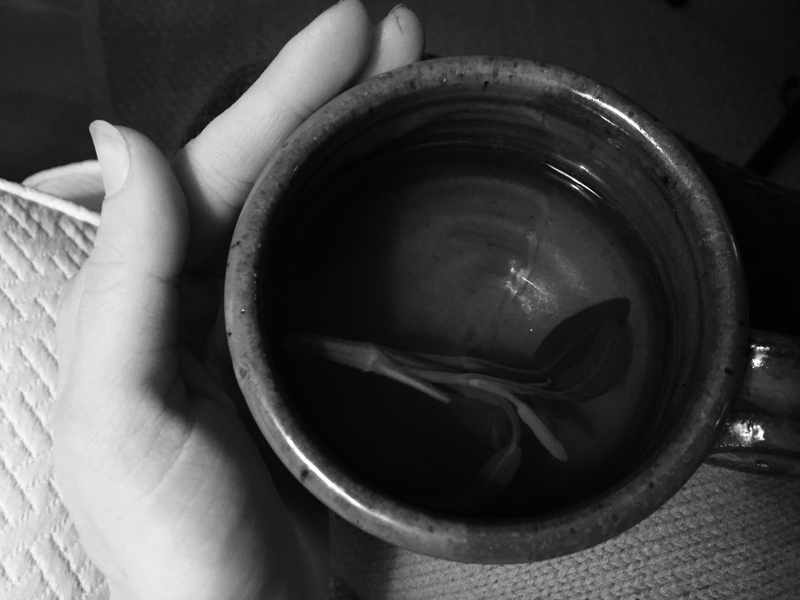 The clay vessel fits perfectly into the curve of my palm, and I breathe in the herbal scent, the steam. After awhile, I take a drink. It tastes like rain in the fields. Thank you for sharing this peaceful moment. We’re learning by your awareness. 🙂 What a kind thing to say … We all need a peaceful moment how and again. My pleasure to share!! I could almost taste the sage tea as I read it! So refreshing, so calming – thanks for sharing. Don’t worry, she is a regular correspondent and so is used to me by now. But we English are renown tea drinkers, though I’ve never tried the one you described though. Do try it, Andy! It’s a favorite of mine. Sometimes I’ll add a few sprigs of time or a lemon slice, depending on how I’m feeling. It’s a nice sore-throat drink, too, especially with a splash of bourbon or brandy. Very beautiful and ever shall it be the little things the given us true joy. Thanks for sharing!!! Amen. 🙂 Thanks for reading! I was eating strawberries with plain kefir as I read about your sage tea, and I had to put my phone (on which I was reading) down. I paused, and I took time to notice the flavors dancing across my tongue and the last rays of sun casting pale light outside my window. Thank you! What is more to enjoy than a simple cup of tea? Watching the last leaves fall from the trees, as the winter light turns grey? If you have a chimney, turn it on. Indeed. I’ve trying to get a chimney built in the house for some time, but there always seems to be a (bad) technical reason not to. I think I will sell the house and buy a chimney with a house around it. I actually don’t know those. Maybe it’s an american thing. I’ll look them up. Yes, I may cringe, though it is your fire-place. One suggestion. No need to disable the fire place, just saw a large plank, to fit inside the chimney and start lighting the candles. All sizes, shapes, colours. Don’t scrape the wax. Put new candles on top of the old ones. It slowly evolves into something lovely. That would be the beauty of Chaos? Thank you Alfa Zulu. But don’t heed my thoughts too much: I’m basically a lateral-thinker. Which is useful in many activities, but can also lead to crazy stuff. You getting ready for Christmas? Ah, the world needs all types of thinkers. I like your lateral thinking, actually. I call my own approach “watercolor logic…” It’s beautiful and open and very free-flowing, but there aren’t a lot of hard lines. Which can be interesting, but … It also means I sometimes struggle to create healthy boundaries, and that I dissolve into a puddle of freaked-outness when I have to make big decisions. Thank heavens for people like my T, whose black-and-white approach is a good anchor for me. I will use the concept of watercolour logic. Like it. What a lovely challenge you’ve given yourself. I started mine, too in November and it has been wonderful. I shared my experiences with friends and they’ve been very supportive. Best wishes for your journey.